These copper 3 row beaded hoop earrings measure approximately 1/4" wide and have a 5/8" hoop diameter. 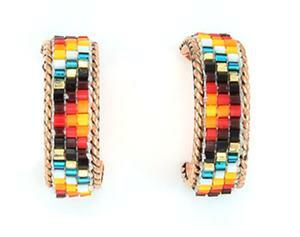 Made by Navajo artisan Geraldrita Whitethorne. Colors and patterns will vary. Posts are sterling but backs are silver plated.